Every day, the number of US Citizens going abroad continuously grows, as more Americans have become interested in chasing adventures in other countries, some go international for their professional dreams, some choose to become entrepreneurs and invest outside the US to look for a greener pasture. It’s not surprising to know that many US citizens and companies invest outside the US, most commonly because the United States has the second highest corporate tax in the world. Still, contrary to popular belief, leaving the US or doing your business abroad doesn’t really take you off from the eyes of the IRS. If you are a US Citizen or resident who is an officer, a director or a shareholder in a certain foreign corporation, you must be fully aware of Form 5471. Under the US Code Sections 6038 and 6046, every United States person involved in any foreign business entity, must report information relating to the name and principal place of business, nature of business, certain transactions and other information which the Secretary prescribes. Form 5471 or the Information Return of U.S. Persons with Respect to Certain Foreign Corporations, is what satisfies the reporting requirements of the said sections and related regulations. The Form 5471 is an annual statement required by the Internal Revenue System to any US persons who have a certain level of control in certain foreign corporations. The form serves to report the information, activities and transactions of the foreign corporation. Wherever part of the world you are doing business as long as it’s outside the US, and whether you’re a US Citizen or a US green card holder, you are tied to reporting obligations set by the IRS. Even if you’re not in the US, as long as you hold a US citizenship, and owns at least 10% of a foreign corporation, you are required to file the Form 5471. 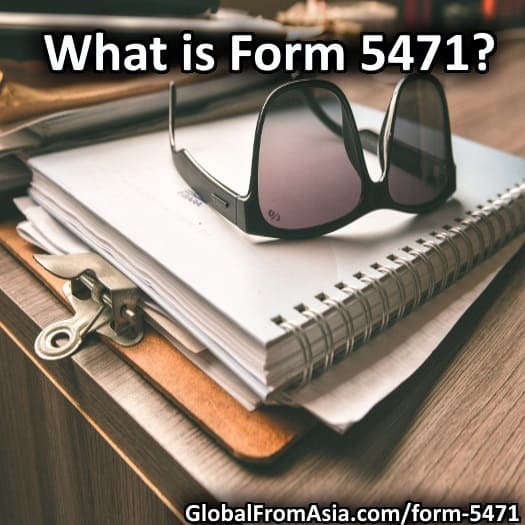 Form 5472 is for foreign persons owning at least 25% of a certain US company, while form 5471 is for US citizens owning at least 10% of certain foreign companies. There are 5 categories of filers that apply to filing the form 5471, they are simply called Category 1, Category 2, Category 3, Category 4 and Category 5. Category 1: The first category has been repealed or cancelled by the American Jobs Creation Act of 2004.
at least 10% or more of the total combined voting power of all classes of stock with voting rights. Category 3: US citizen or resident who acquires stock in a foreign corporation that meets the 10% threshold requirement. A US citizen who sells down or disposes stock in order to reduce his or her stock ownership requirement still falls under this 3rd category. Category 5: US citizen or resident who directly, indirectly, or constructively owns at least 10% of the total combined voting power of all classes of voting stock of a controlled foreign corporation (CFC). For example, if a foreign corporation is partially owned by several US citizens and they each have at least 10% share of the foreign corporation, they are considered as Category 5 filer. Form 5471 must be filed together with the tax payer’s income tax, partnership, or exempt organization return by the due date (including extensions) for that return. For corporations, it could be March 15th or the extended due date. April 15th for individual tax payers and June 15th for the expatriates. Failure to submit and accurately complete the form 5471 can have significant penalties to any US citizens who are officers, directors, or shareholders in certain foreign corporations. A whopping $10,000 penalty may be imposed for any US person who fails to furnish the required information within the time prescribed. IRS shall send the US person a notice of the failure by mail, the US person must then file Form 5471 within 90 days after receiving the notice, otherwise he/she will be charged an additional $10,000 penalty for each 30-day period. The additional penalty is limited to a maximum of $50,000 for each failure. Form 5471 is known to be one of the most confusing, tricky and complicated requirements imposed by the IRS to American entrepreneurs and investors. This form is not just an ordinary information return that can be simply done by anyone. There are parts of it that confuses many, especially in determining which category of filers you fall into, as well as determining the ownership interest. It requires complete and accurate details to avoid substantial penalties. It’s always best to consult and seek help from your tax advisor in order to satisfy your reporting requirements and avoid corresponding penalties.